Bloating and abdominal pain are common complaints in the IBS community. 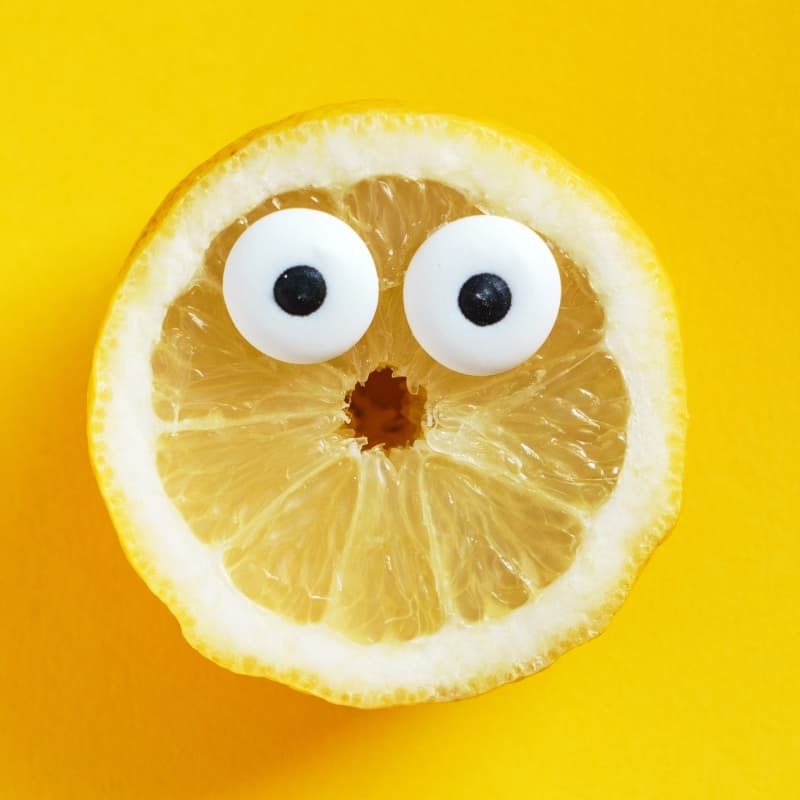 But, while there are plenty of articles on the top ten foods we should never eat, suggestions for products we can purchase, and anecdotal evidence on finding temporary relief, I haven’t found much information on how to cope with IBS related bloating in the moment. I decided to write this article after competing in the 2017 Scotia Bank Toronto Waterfront Marathon. I trained for eight months, I ate a nutritious and well-balanced diet and strictly adhered to my customized low FODMAP plan. I went to sleep the night before my race looking and feeling like a prepared athlete. I woke up the next morning looking like I might give birth to twins in the starting corral. I know my symptoms were caused by anxiety over my first major race, but it really tarnished the experience for me. I felt uncomfortable in my clothes, I felt self-conscious standing in the starting corral, and like I wasn’t in control of my body every time I passed a race photographer. Post-race, as my family celebrated around me I was overwhelmed with the feeling that I had done everything right, but this wasn’t how I was supposed to look, and these weren’t the pants I wanted to wear. It was an incredibly frustrating experience for me. Especially as someone who blogs about the life-changing impact of the Low FODMAP Diet. 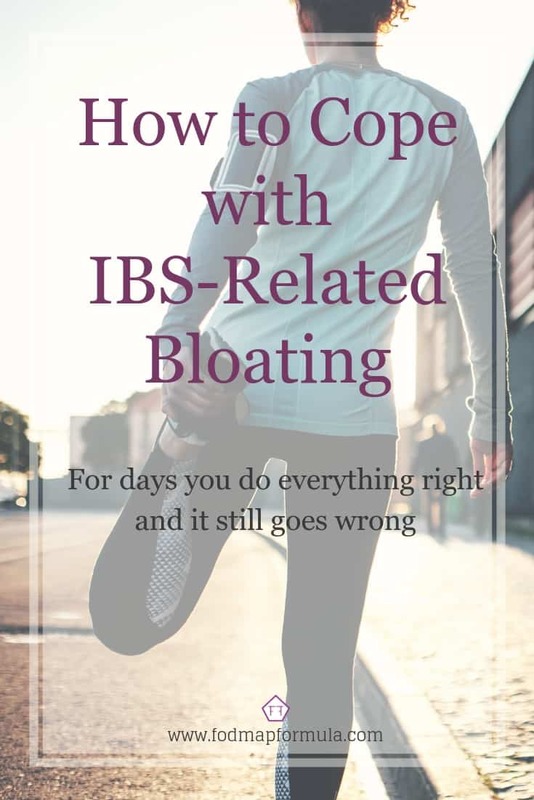 Because I’ve heard this story repeated almost daily in the IBS community, I thought I would ask some professionals for their thoughts on coping with IBS related bloating when things go off the rails. 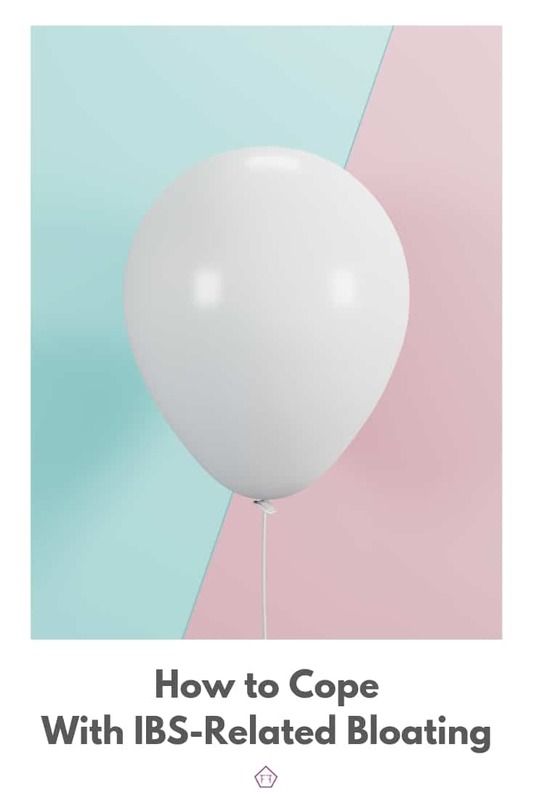 I spoke with Dr. Barbara Bolen, a US-based health coach and IBS expert, who believes part of coping effectively with IBS related bloating means being able to separate feelings based on the current situation from our thoughts and assumptions. Dr. Bolen explained that feelings of anger and disappointment are a direct reaction to our current situation. She says, though they aren’t pleasant, they are a healthy expression of how we feel. She specifies these feelings are “our psyche’s way of giving us feedback about our world.” As such, feelings like these should be validated, because they show us how our immediate situation is sitting in us. She continued, saying feelings of embarrassment or shame, however, are based on assumptions of how we think things should be; or how we imagine others expect them to be. This means, in addition to our genuine feelings, we’re also flooded with emotional reactions based on information that may or may not be correct. Using the example of IBS and bloating, Dr. Bolen said distorted thoughts might sound like: “I should be in control of how my body looks” or “people will judge me negatively because of how my body looks.” But, Dr. Bolen is quick to point out that no one has absolute control over their body. Additionally, she suggests that most people are so wrapped up in themselves they often don’t notice the people around them. Dr. Bolen believes that once these “distorted” thoughts have been challenged, our remaining and genuine feelings will become more manageable. On the subject of distorted thoughts, Jay Walker, a Toronto-based mental health and body image advocate, indicated that our perception of ourselves is greatly influenced by unattainable ideals. This means when we experience symptoms like abdominal distension, the input we use to determine if our bodies are “acceptable” or “unacceptable” is skewed. Living with chronic illness can at times leave an individual misunderstood, isolated, and with feelings of hopelessness. Finding community can be life-changing when it comes to navigating these physical and emotional difficulties. If this is something you think would be helpful to you, there are many active online IBS communities available on Facebook and Reddit, as well as public online forums dedicated to Irritable Bowel Syndrome. I also spoke with Toronto-based psychotherapist Natalie Riback, who emphasized that it’s important to remember “in every endeavour we take on, there will be days when we feel successful, and other days where we feel like we’re spinning our wheels.” Riback said it’s important to be mindful that how we feel about ourselves can play an important role in influencing our failures and successes. This means it’s important to frame our experiences based on tangible evidence, not distorted thoughts or our best attempts at mind-reading. The thing we must always remember when we are having a bad day, despite the efforts we’re making to stay on track, is intention. Our intent, our objective remains the same, even when we feel out of sync, even when our body is not responding the way we want it to or even think it should. If we can stay close to the intention we have to be better and stronger, it will not only help get us through the tougher days but we are far more able to get back to a place of success when things come back into alignment. This being said, it’s important to remember that even when you find the tools to manage your IBS symptoms long-term, there will be stress, and illness, and poor sleep, and sneaky FODMAPs that derail you. That’s life, not failure. It’s ok to be disappointed, or frustrated, or angry about it. But don’t give up hope that your symptoms are temporary, and that there are better days ahead. I took a lot of things away from my personal marathon experience. First, a keen awareness that the symptom-management tools we employ each day aren’t foolproof, and that their failure is not my failure. Second, that a bad day is not an excuse to lose sight of my overall goals or to cheat myself out of a good tomorrow. Finally, that part of suffering from Irritable Bowel Syndrome means being prepared to face my illness head-on every day. For me, this means lacing up and training for my second marathon; knowing I might not look the way I want to on race day, and buying my lucky pants in two sizes – because next time I’m smiling in those photos no matter what. Want more articles like this? Subscribe to my mailing list below. 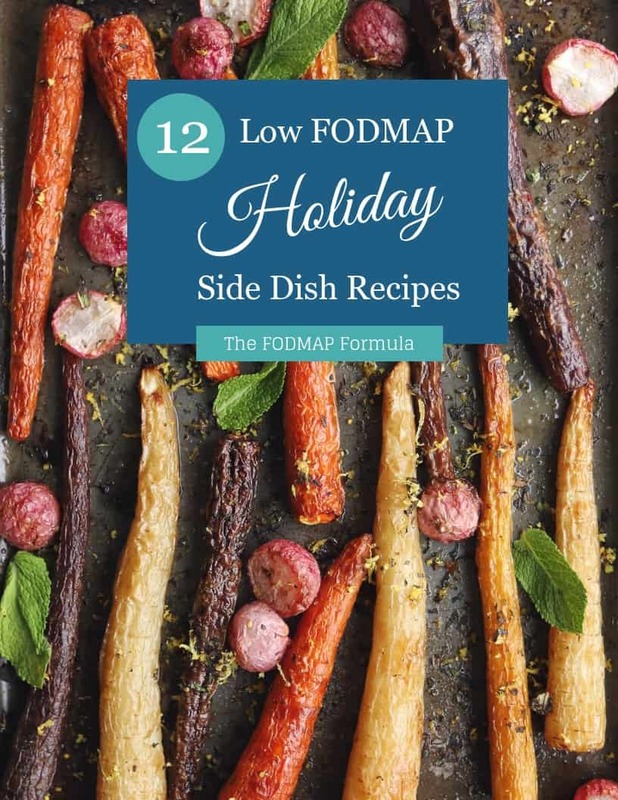 You’ll get new articles and FODMAP friendly recipes delivered right to your inbox. You can also follow me on Facebook for more articles and research on Irritable Bowel Syndrome and the low FODMAP program. Together we’ll get the Low FODMAP Diet down to a science! Thank-you for a great article! Sharing your own difficult personal experience is very helpful. Reading this reminds me that I tend to think in a negative way and blame “flares” on “my” failures; and that I can do something to change my perspective. Since I started the Low FODMAP Diet I’ve had a really good handle on my daily symptoms. But things like stress, poor sleep, or illness can still throw me for a loop. I hope the next time you’re having a flare-up you come back here and remind yourself that this happens to all of us, and it’s not necessarily something we can influence (positively or negatively). Thanks Amy for expressing how I feel when I think I’ve done everything right and then get a terrible flair up. It’s just so frustrating! While it makes me sad you feel frustrated, I’m glad I could share this experience with you. It’s often disheartening when we do everything we’re supposed to and our bodies still fall apart. It’s even harder still when we get trapped in our heads or confide in people who genuinely don’t understand what it’s like to experience these symptoms. Thanks for taking the time to let me know the article resonated with you. Nice article! I admire your spirit and dedication. Thank you very much, Sheila! I had a great support network and they helped me push through.